Every Kindness Counts | Choose Your Energy: Change Your Life! Have you ever thought about doing something kind for someone, then filed that thought away for later, only to forget about it completely? Have you ever thought about doing something kind and did it right away? What was the result? Chances are, you made that person’s day and your day as well. 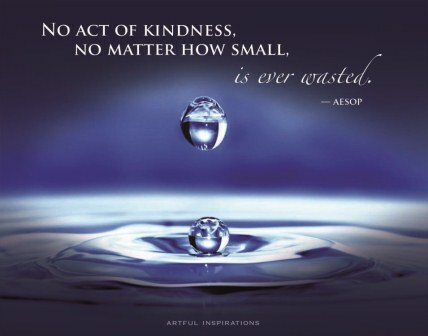 You can never know the full effects of your acts of kindness and generosity and how their ripples will continue to constructively impact the world long after you are gone. When you plant seeds of love, respect, curiosity, compassion and gratitude, everyone enjoys the fruits and grains of your kindness and generosity for years to come—including YOU. Everything you do makes a difference. The gifts that you have to offer the world are priceless. Don’t lock your gifts away in the cold vaults of “someday.” Share them early and often, allowing the world (and your life) to benefit from your unique, irreplaceable contribution. You are a precious natural resource never to be squandered or taken for granted. Release your limiting beliefs, reclaim your power, pay attention and step into your greatness. How will you choose to touch lives with hope, possibilities and empowerment today just by letting your light shine fully? This entry was posted in All My Blog Posts, Authenticity & Purpose, Creativity & Self-Expression, Curiosity, Respect & Compassion and tagged Deborah Jane Wells, What is authenticity, What is compassion, What is creativity, What is curiosity, What is life purpose, What is my life purpose, What is respect, What is the meaning of life, What is the purpose of life. Bookmark the permalink. Pingback: Anger is Not a Four-Letter Word | Choose Your Energy: Change Your Life!